Measuring 15"w x 22"d x 25"h, our Mission Chairside End Table will add the beauty and simplicity of mission-style to your home. The clean design of this accent table that can be placed next to a chair for easy access to a drink, remote, or blanket includes a solid, rectangular top with slight overhang, a drawer, door and slight arches that help to form the legs and base of the piece. 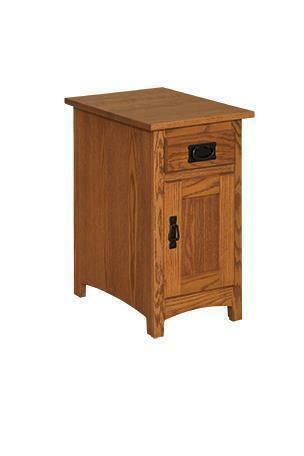 Available in oak, cherry, or brown maple with your choice of finish and hardware, make it yours today.